CINCINNATI -- Spend an afternoon tooling around the downtown area here and you'd never know a major election is just two weeks away. In recent months, President Obama's and Mitt Romney's teams have each claimed to have the edge in voter enthusiasm. But now that both camps are trying to turn out the early vote in this crucial battleground state, that enthusiasm isn’t particularly high on either side. 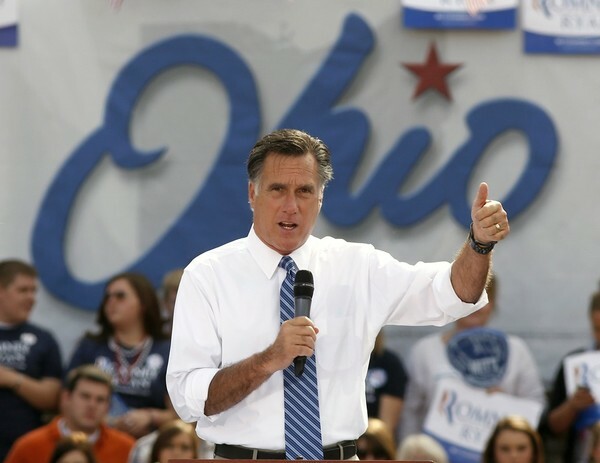 Cincinnati is as conservative as a major metropolis can be, which should make it a Romney stronghold. But throughout downtown this past weekend, there were no signs or clipboard-toting volunteers -- in other words, no discernible presence for either campaign. Downtown Cincinnati has worked hard in recent years to attract visitors by investing in construction and new establishments, but the real draws for area residents are the big sporting events: Bengals’ football games and Reds’ baseball games. Sunday night featured a major rivalry: The Pittsburgh Steelers came to town in the featured prime-time NFL game on NBC. Paul Brown Stadium was sold out for the AFC North showdown. What better place for the campaigns to find more than 66,000 potential voters from obviously important Ohio (and the emerging battleground of western Pennsylvania)? The Romney camp did send a campaign bus to one of the parking lots filled with orange-and-black clad tailgaters. But they parked it in the back of the stadium and away from the downtown area, leaving it tucked into a dark, wooded corner beneath a bridge near the Ohio River. An interested spectator needed several sets of directions from traffic cops to find it. Sam Wyche, who played for the Bengals in the 1960s and coached the team in the 1980s, was the campaign’s headliner at the tailgate party in front of the bus. He wound his way to a couple of other groups of revelers and gave a toast to one. Wyche, who lives in Greenville, S.C., said he was uncommitted during the Republican primary but came around to Romney after the first two debates. “We need a businessman,” he told RCP. The Obama team largely has been able to turn Romney’s greatest strength -- his business background -- into a potential liability here through a series of campaign ads excoriating his practices at Bain Capital. But in this big-business-oriented town, voters who told RCP they were backing Romney cited that very experience to explain why they’re behind him. Jerry and Carol Cain, a couple from Colerain Township, were listening to a pre-game concert in Fountain Square before splitting off from the festivities to see a show at the Aronoff Center. Carol Cain said she thinks of Romney as more of an executive than the incumbent president. Jerry Cain pointed out that Cincinnati is a “very strong conservative, pro-business area,” and that’s why Romney is more popular here than in other parts of the state. He complained, though, that the GOP nominee has not played up that he took just a dollar in annual salary as governor of Massachusetts. Asked what he thought would happen in Ohio and in the presidential election overall, he said Obama would likely prevail. In Ohio, he said, “he’s won all the court rulings” -- a reference to legal challenges to early-voting rules. There was one glaring exception to the dearth of politicking outside the stadium: Sean Sutton, a volunteer from the Norwood area who was standing at the corner where Elm Street feeds into the stadium entryway.